Home Markets ETFs Reader Q&A: Is ROBO A Better ETF Than BOTZ? Question: Is ROBO a better ETF than BOTZ? Answer: The robotics sector is mostly represented by the ROBO Global Robotics and Automation Index ETF (ROBO) and the Global X Robotics & Artificial Intelligence Thematic ETF (BOTZ). Thanks to returns of more than 40% in 2017, total assets in each of these funds has ballooned to more than $2 billion. Since ROBO and BOTZ both target the same segment of the market and manage roughly similar amounts of money, the question of which fund is better comes up often. To set the table, let’s take a look at the two funds. ROBO follow the ROBO Global Robotics & Automation Index, which provides exposure to nearly 100 different companies that derive a portion of revenues and profits from robotics-related or automation-related products and services, such as artificial intelligence, unmanned vehicles, 3D printers and medical robots. Currently, more than half of the fund’s assets reside outside of the United States, while just 1/4 of assets are in large-caps. BOTZ, on the other hand, is more concentrated. 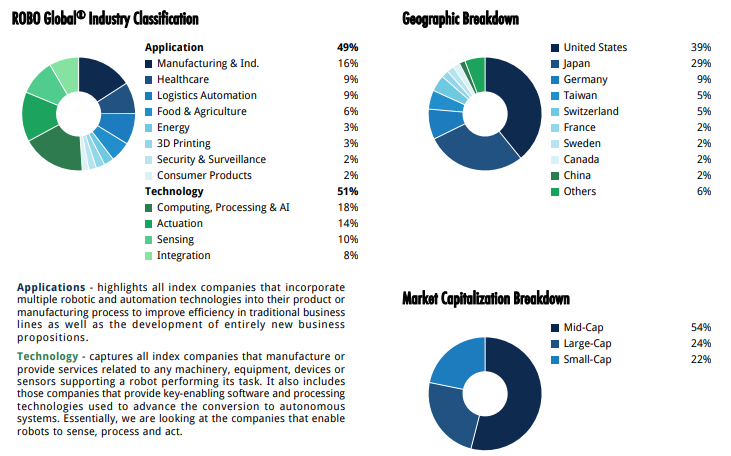 It’s tied to the Indxx Global Robotics & Artificial Intelligence Thematic Index, which provides exposure to companies in developed markets that are involved in the development of robotics and/or artificial intelligence, including industrial robots and production systems, automated inventory management, unmanned vehicles, voice recognition, and medical robots. In other words, a lot of the same themes as ROBO. Previous articleXBTC: Are We Finally Getting Close To The Elusive Bitcoin ETF?